I wrote a post about styling our bar cart back in January, but today the West Elm catalog showed up with a perfectly affordable bar cart that would totally work in our house, so I wanted to share a few of my favorite bar carts currently available, if you're not willing to hold out for a vintage one. 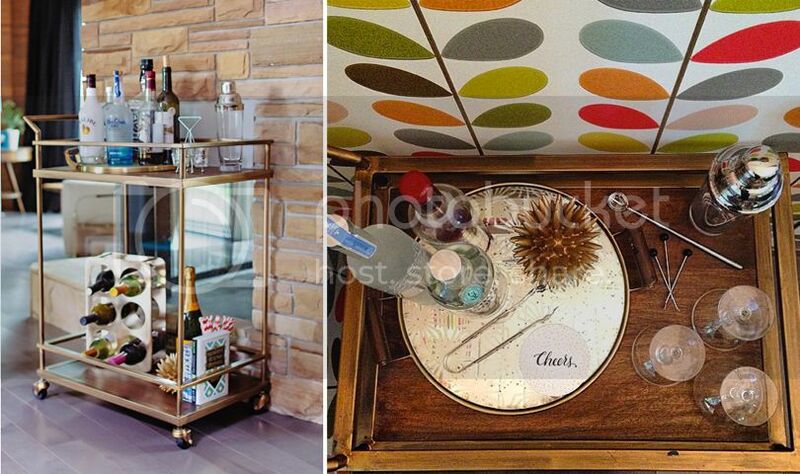 The Parker Bar Cart and the Terrace Bar Cart are both from West Elm. I like them both - the Parker has warm wood tones with brass side rails and is currently under $300. The Terrace is brass and mirror, and also comes in silver & mirror, which I love in so many settings. This one is currently $340, but completely more affordable than the ones I keep seeing on 1st Dibs, and certainly more affordable than the crazy Jonathan Adler bar cart! The Safavieh bar cart is $200 and from Target. It is brass and mirror, and I love the sloped handles on both sides. Our bar cart is from Target. It's the Threshold (Target's private label) brand, and it was under $100 on clearance after Christmas last year. They still sell it - online only - and it's currently $130. It doesn't roll very easily - could be all the weight I have piled on it - but it looks great and does the job. As you can guess, it gets dusty and crowded, so about once a month (when I think of it), it gets rearranged and cleaned.